four cylinder model A or B engine. 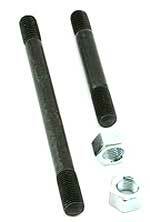 Chrome moly stud/nut kit 1928-31. Same as our standard head stud/nut kit except these studs and nuts are made of 8740 chrome moly steel. Guaranteed not to stretch. Made in USA. Head stud & nut set 1928-31. A complete set of studs and nuts for the head. Includes the water outlet studs and the slightly longer stud for the stamped ignition clamp. Grade 5. Made in USA. These studs are Grade 5 hardened and have a domed head with the original raven finish. 11 regular 3 1/2" studs, one 3 3/4" ignition stud for March 1929 thru 1931 engines and 2 water outlet studs 5 3/4". The top of the studs should be 1/32 above the nuts. Torque head nuts to 55 foot pounds for the standard head and 65 foot pounds for the higher compression heads after engine has become cold. Some of the cylinder heads are a little taller and need a slightly longer stud. These studs are Grade 5 and consist of 12 studs 3 3/4" long and 2 water outlet studs 5 3/4" long. Heavy Duty Head Stud Set for the model B engine. Fourteen Grade 8 hardened studs with correct domed head end. Torque to 65 foot pounds. These will not stretch. 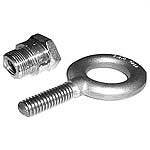 These stronger studs are suggested to be used with high compression heads that require a higher torque. This set is for the 1932-4 cylinder engines. Head nut set for the 1928-34 model A or B engine. These are the correct thick nuts for the head. Cad plated, just like the originals. Set of 14. 1928-48 Cylinder Head Nut. Cad plated. If you are running an aluminum head, these stainless steel washers are essential. Made of stainless steel, these are SAE washers which means they have a smaller O.D. than a normal flat washer. 15 per kit. 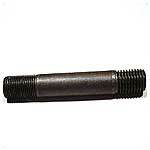 The standard length cylinder head stud for the model A and Model B engine, 3 15/32" long. Head stud for the water outlet on the front of the Model A Ford engine. 5 23/32" long. Two are required. Pop Out Cable Clamp 1928-31. The clamp that mounts on the head to hold the cable going to the distributor. Made in USA. These studs are slightly longer for the ignition cable clamp. Authentic for Jan-Apr 1928. Made in USA. Ignition clamp stud Apr 1928-Mar 1929. These studs are slightly longer for the ignition cable clamp. Made in USA. Ignition clamp stud Mar 1929-End. These studs are slightly longer for the ignition cable clamp. Made in USA. Stud thread repair kit 1928-34. This kit gives you everything you need except a drill bit for reapiring head and manifold stud threads in the block. Made in USA. This is the replacement drill bit for the A-5065-RK stud thread repair kit. This lower cost handy tool bolts to the head surface of the block and provides a drill guide bushing and long drill bit for getting your pilot hole centered on the broken stud. 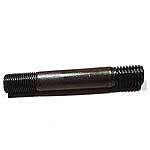 Repair stud 3 1/2". If you have a stripped thread hole in the top of your block for one of the short head studs, this is better than a Heli-Coil repair. Top end of this studs is the original size, but the bottom is 1/2-13. Just drill out the damaged thread hole to and tap to 1/2-13 and install this special stud. Cylinder head epair stud 3 3/4". If you have a stripped thread hole in the top of your block for one of the short head studs, this is better than a Heli-Coil repair. Top end of this studs is the original size, but the bottom is 1/2-13. Just drill out the damaged thread hole to and tap to 1/2-13 and install this special stud. Repair stud 5 3/4". If you have a stripped thread hole in the top of your block for one of the short head studs, this is better than a Heli-Coil repair. Top end of this studs is the original size, but the bottom is 1/2-13. Just drill out the damaged thread hole to and tap to 1/2-13 and install this special stud. Repair Stud Tap A-6066-TAP. This is the tap needed when using the oversized head repair studs. 1/2" - 13. This is the special 27/64" drill bit for the head repair studs A-6066-RK, A-6066-CRK and A-6067-RK. You will also need the special tap A-6066-TAP. 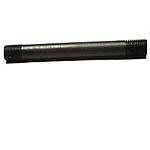 Head nut torque tool adapter 1928-31. Special tool allows you to torque the head nut that is beside the distributor. You normally have to remove the distributor to get a torque wrench on that nut. Made in USA. Engine Lift Eye for the 1928-34 four cylinder engine. Threads into the spark plug hole in original style cylinder head and has a large eyelet for a chain hook to hook through. Can also be helpful in removing a stuck head. Made in USA. 1928-34 High compression 6.1 cylinder head. This is an all new cast iron high compression head for the Model A that is stock appearing on the outside. The compression ratio of this head is 6.1:1 with 152 CC chambers. This is the head manufactured by Snyder's in the USA. Note: The Model B head gasket B-6051 is recommended when using this cylinder head. 1928-34 High compression 5.5 cylinder head. Made of cast iron with all original appearance. The compression ratio of this head is 5.5:1 and bolts up just like your stock head did. This is the head manufactured by Snyder's in the USA. Thomas high compression head 1928-31. Aluminium finned head in 6:5:1 compression. Head is drilled and tapped for stock A plugs. You can not use the stock model A ignition cable because of the fins. Made in USA. Note: The Model B style head gasket is recommended when using this cylinder head. Whenever you install an aluminum head, it is a good idea to install this waste metal cathode in the coolant system. The cathode will deteriorate instead of the head! Made in USA. Head puller for the 1928-34 Model A and Model B Engine. Attaches to head with special hardware that screws into the spark plug holes and lifts the head from the block. Can also be used for lifting the engine. Made in USA. This tool works on both Model T's and Model A's. For drilling out broken cylinder head bolts on engines using the cylinder head and special drill bushing as a drill guide. Directions: With the cylinder head on the engine and all other cylinder head bolts tightened, insert the special drill bushing and use the special size drill bit to drill out broken head bolt. After the head bolt has been drilled through, remove the cylinder head and clean the head bolt threads in the cylinder block with a standard 7/16-14 tap (not included). Use compressed air to blow out the tapped hole to remove any debris. This is a high quality set consisting of 10 pieces that are needed to drill out a broken head stud. Using the 2-locator plates allows you to accurately locate the drilling fixture over the stud that is broken off. Designed by a mechanical engineer for use on his car. Kit includes detailed & illustrated instructions. This kit contains the drill bit, tap and bushings for the standard thread studs.